Project Alicia : The Little Things. It doesn't take much to make me giddy. A simple bud. A perfect texture. Five minutes of sun. Don't know about you, but for me it's all about the little things. If you are still following my 30 Days of Spring Photo Challenge, this is day 15 if my count is correct. It runs through May 15th and you are welcome to join at any time. There are no rules or requirements. And sorry, there are also no prizes at the end. It was started as a way to help get me through the "waiting" part of Spring, as Mother Nature seems to be on her own timetable this year and has forgotten to send the memo. We're in the 40s this week, but it is still a bit too cold for my taste. You can do as little or as much as you want. Just grab your camera and document what spring looks like to you in your neck of the woods. Today I was ecstatic to find my rhododendron blooming. And the deer haven't even touched them yet. If you need some inspiration you can check out my Week One in Review or my Is it spring yet? post. Or better yet, go stop by the 30 Days of Spring flickr page. Oh my. The photos coming in are exquisite. If you want to play along, you can add your pics to my 30 Days of Spring flickr group, you can tweet it using the #30dos hashtag, or you can do a post and share it here at project alicia. (The linky is over at Day 1.) Grab the button and start snappin. Thank you to all who have shared their spring with me! What a lovely quote! I could visualize the touch of the Master's hand coaxing new life to open up and come forth. Absolutely gorgeous - I love what you did with the text. Love it. That simple bud is a great image to show the start of spring. That is a great quote and positioned perfectly. You really nail the details! Oh wow...this is soooooo pretty!! 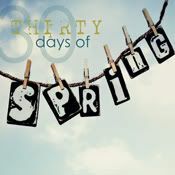 LOVE the idea of 30 Days of Spring! Since we've only had about 5 days that really feel like Spring here (it actually SNOWED here this morning!! ), getting pictures when I can is about all that's keeping me from the winter blahs all over again. LOVE the shot and love the quote. Perfect! Happy to have found your blog!! 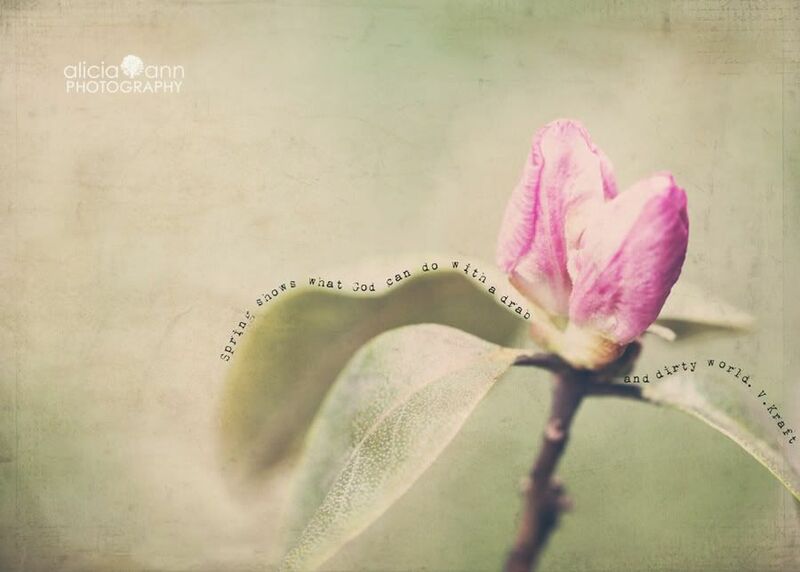 beautiful quote complimenting a lovely photo. I love how you added the text in this picture along the side of the leaf! The result is just beautiful! Beautiful Alicia- I love the creativeness! I love everything about this...the photo itself, the texture, the text. It's just beautiful. Thank you for sharing your pretty post at Photo Feature Friday! This is so lovely! Both the photo and the quote are perfect! Just gorgeous! I love the wording you added!! Thanks for linking up! absolutely loved the photo! stopped by from a rosy note... do you have a tutorial on how to do that with the quote? i would love to know how! This is awesome, awesome, awesome! Beautiful. Thanks for participating in Fabulous Friday! Congrats Alicia! Your photo was picked for the top five for Fabulous Friday. Thanks for participating! Congrats!!! Love this photo...You are in the Top three!